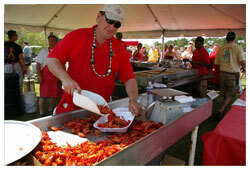 The Annual Lowcountry Cajun Festival heats up James Island County Park! Bringing Louisiana living to the Lowcountry, Cajun Fest is a full-day of Zydeco music, Cajun and Creole foods, children’s activities and all around ragin’ Cajun entertainment! Full-bellied fun is what this festival is all about as local and regional chefs cook up a variety of mouth-watering foods. Savor the tastes of authentic Cajun and Creole fare. Enjoy jambalaya, alligator, etouffe, andouille sausage and of course, crawfish, crawfish, crawfish! Also enjoy Lowcountry favorites like seafood and Southern barbecue. For those who prefer a tamer menu, we’ll serve up ample portions of festival foods like hot dogs, snow cones, funnel cakes and more. Think you know how to properly eat a crawfish? Then this event is for you! Visitors travel from near and far for huge servings of fresh, steaming crawfish, undoubtedly the festival’s most popular food item. If you’re a connoisseur, the annual crawfish-eating contest at is the perfect opportunity to show off your unique talent! Non-stop Zydeco music performed live throughout the day will keep your hips swingin’ and toes tappin’. Check www.ccprc.com/cajun for a current entertainment schedule. For dates and more information visit www.ccprc.com/cajun.